"The brown algae appears when the aquarium is young, is brown in color, and covers everything from walls to driftwood to leaves like a thin curtain. It is easily dealt with by adding a natural enemy, the best of which is Otocinclus." With these words and the virtual omnipresence of Otocinclus in his fabulous planted aquaria, Takashi Amano and his seminal book, Nature Aquarium World, have helped foster a desire among aquarium plant enthusiasts to house Otocinclus in their tanks. These diminutive heroes do indeed have much to commend them. As Amano points out, they do a great job of removing certain types of algae. Moreover, they do this without damaging the most delicate of plants. They are typically inexpensive, readily available, relatively easy to care for and are certainly fun to watch. So much so, in fact, that in Southern China and Hong Kong, Otocinclus are often sold under the name "little monkeys", a moniker that aptly describes the sight of a school of these fish cavorting through the "jungle" of a densely planted aquarium. Yet, while increasingly popular, much about these charming little fish remains poorly understood. The trade name Otocinclus, or "Oto" for short, refers not to one particular species but to several related genera, comprising about two dozen species. This article sets out to introduce Otocinclus, their place within the wider world of sucker-mouth catfish, and the knowledge necessary to give them appropriate care. Taxonomy: Don't get technical with me! Otocinclus are commonly known as "Otos" or "dwarf sucker-mouths". Perhaps the latter name is slightly more appropriate, as not all the species we will discuss belong to Otocinclus; but then again Oto is much shorter! Let us first define what is and what is not a dwarf sucker-mouth. To do that, we have to delve into a little science. Virtually all aquarists know a "pleco" when they see one. Whether we are discussing the giants of the family, the striking zebra plecos, whiptails, bristlenoses or otos, we are talking about South American sucker-mouth catfishes that belong to the family Loricariidae. With more than 70 different genera and well over 600 described species (with many further species available to aquarists but still undescribed to science), it is the largest family of catfish found for sale in the pet trade by far. This huge range of species gives the aquarist a vast, yet often difficult choice in selecting suitable sucker-mouths for their tanks. To further sub-divide this large family, scientists currently classify each genus into one of five sub-families. Firstly, we have the Hypostominae, which includes the "common pleco" (Hypostomus spp.) and the sailfin pleco (Pterygoplichthys gibbiceps). Generally these fish are omnivorous and good algae eaters, but they are even better plant eaters! Furthermore, they grow to large adult sizes and generate vast amounts of waste. Adults of these species would destroy a densely planted tank in minutes just by swimming around. Even though most specimens available in pet stores are small juveniles, they grow rapidly given reasonable care, and soon outgrow their welcome. Next are the Ancistrinae. Recent research suggests that this family is part of the Hypostominae. In terms of husbandry it is the most varied of the sub-families. Within its ranks can be found the mid-sized Ancistrus species, commonly known as "bristlenoses", which do have a place in the planted aquarium but can be destructive as adults. The strikingly beautiful Zebra plecos (Hypancistrus zebra) are out-and-out carnivores, and are a questionable choice for the typical planted tank. Clown and Royal plecos (Peckoltia or Panaque sp.) are typically opportunistic omnivores, but certain large Panaque species will eat almost any plant matter, including, as recent scientific research shows, wood! The strong teeth developed by these fish to rasp away at submerged wood will scratch and spoil Plexiglas tanks, and they have even been know to remove silicone sealant from glass tanks! While the Ancistrinae are among the most interesting and colorful catfish in the hobby, they are not (with the arguable exception of Ancistrus) good candidates for the typical planted aquarium. Aside from the dietary preferences, many of these species require a strong, oxygen rich current to thrive. Though you may get away with only moderate damage to plants in the short run, in the longer term, plants and / or fish are likely to suffer. Next we have the Neoplecostimae sub-family, the members of which are the least suitable of all Loricariids for the planted aquarium. Aside from the fact they are rarely imported, they are, in the main, catfish from fast flowing, oxygen-rich, cool water that require these parameters to be replicated in the aquarium. The sub-family Loricarinae is most commonly represented in pet stores by the whiptails or lizard cats. All members of this family are so elongate that, even for plecos, they are poor swimmers. Members of at least two readily available genera (Sturisoma and Rineloricaria) can thrive and even perform meritorious service in the planted aquarium. These fish look so bizarre, more like insects or lizards than fish, that they are almost guaranteed to stir up conversation by jaded guests who might otherwise not find anything remarkable in even a lushly planted and well-maintained aquarium. While some of these fish grow quite large and could be difficult to accommodate in the typical home aquarium, the specimens sold in the trade usually remain at a reasonable size (5-6") even as adults. Unfortunately, other members of this sub-family (Farlowella species, for example) seem to live short lives in the aquarium. It has been speculated that even in nature they live for just a season, like killifish, but this is unlikely to be true. Some aquarists have kept them for years on end. It is more probable that they fare poorly largely because they are somewhat delicate fish that adjust poorly to the rough conditions of their capture and transport. Once settled, they require consistent, high quality water conditions. Being shy fish, they are more likely to thrive in a well-planted tank than in a relatively bare one. While fish in the whiptail group do eat algae and generally do not damage plants, they are not voracious algae eaters. Although not schooling fish, kept in sufficiently large numbers, say 1-2 per 10 gallons, they can do a creditable job of keeping soft algae under control. Finally, we come to the sub-family Hypoptopomatinae, within whose ranks we find our Otocinclus. The Hypoptopomatinae is a fairly small sub-family with approximately 70 species belonging to a handful of genera. All are relatively small and are typically found in small streams, and along the densely vegetated, slow moving banks of larger rivers. Superficially, all members of the sub-family look quite similar. Only a minority of these species (perhaps 15-20) are seen in the hobby, where they are generically referred to as "Otocinclus". One cannot blame hobbyists for this confused state of affairs! Even the experts are confused - or at least were until recently. In 1980, Isbrücker separated the subfamily into two tribes, with Hypoptopoma on one side and all the others on the other. Hypoptopoma, which look like larger Otocinclus, are differentiated by having eyes in a lateral position on the sides of their heads (hence the scientific name, meaning "low eyes"), rather than towards the top, as in most other members of the subfamily (and most plecos in general). With the publication of Scott Schaefer's revision of the genus (2), some order was restored to the systematics of the tribe to which Otocinclus belong. Unfortunately, however, hobbyists may now feel more confused than ever because of the major changes made in the old taxonomy and the highly technical criteria used in the reclassification. Ultimately this is all for the good, but it will take a while before most hobbyist literature catches up. In essence many species formerly considered as Otocinclus have now been reassigned into the genera Microlepidogaster (the largest asylum for Otocinclus refugees), Parotocinclus, Otothyris, Pseudotothyris, and Nannoptopoma. Five very similar looking (to the aquarist) new species of Otocinclus are also introduced in the paper. Of these genera related to Otocinclus, only Parotocinclus and the rarely available Microlepodogaster are really suitable for the slow moving, often low oxygen environment of a planted aquaria. The most commonly available species available to hobbyist is the Red Tailed Oto, Parotocinclus maculicuada. As with many a common name this one is misleading, as the fish is one of several species with red fins and isn't really an Oto. While we are on the subject of fins, Parotocinclus are differentiated from Otocinclus by the lack of an adipose fin in the latter. The adipose fin is the small fleshy fin between the dorsal (top) and caudal (tail) fin. This is entirely absent in Otocinclus. The red fin oto isn't a great algae eater, but can be housed in number with true Otocinclus in planted aquaria. To the general hobbyist, size is the primary factor that differentiates Otocinclus from these other closely related genera. Otos are the smallest Loricariids around. Given the fact that all Otos are imported, this means that they are cheaper; you get more algae eating miles out of your dollar if you buy Otos. Their small size, however, means that in order to keep a large planted tank free of algae you need a jungle full of monkeys. Fortunately this isn't a problem for our Otocinclus, who are a sociable bunch. Moreover, all species of Otocinclus commonly imported are the ones suitable for planted aquaria. The most commonly imported species are Otocinclus mariae, O. macrospilus and O. vittatus. There are others and recently the undescribed "zebra oto" has made quite an impact on it's appearance. Otocinclus and their close relatives are widely distributed throughout the Amazon basin. Some rarer species exist in the colder, more southerly parts of Brazil and Northern Argentina, but these fish are seldom exported and you can rest assured that they will not be selling for $2 each! As with most widely distributed species, Otocinclus are adaptable. In the wild they can be found in slow moving, relatively deep water at the side of rivers. The boundary between riverbank and river is often not obvious because of the dense vegetation growing at the water / land interface. 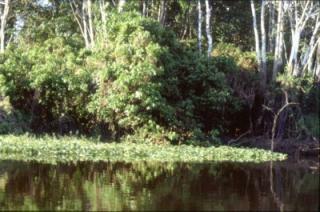 Tall reeds and grasses dominate this region, and it is the submerged part of these plants that Otocinclus call home. 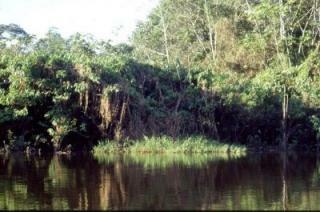 When traveling the Amazonian waterways at, it is common to encounter "floating meadows", large portions of tangled vegetation that have broken loose from the riverbank and aimlessly follow the rivers languid course. Upon close inspection, these mobile green islands are full of fish and are literally teeming with Otos. Local ornamental fish collectors often use these "meadows" to source their catch as they are easier to work with their nets than the tangled shore. We often hear that a large group of Otos has been purchased for a planted tank but the survival rate of these new introductions has been very low. Sometimes even total loss is experienced. We have developed a conditioning procedure to deal with this common problem. The key to our approach is to avoid putting the Otos directly into a planted tank. This is especially important when dealing with large aquaria. For our purposes, any aquarium with a surface area of more than three square feet is "large". Set up a small tank (an 18" cube is a good size, but a tank even half this size will do) with two sponge filters driven by a dual output air pump. There are several reasons for adopting this method of filtration. Firstly, since it is best to use a bare bottom tank with no substrate, under-gravel filtration is impossible. Secondly, the water should be well oxygenated but not overly turbulent. Thirdly, Otocinclus like to feed from these sponges, as well as the tank walls and base. If you live in a cool climate and have access to a sunny window, your oto tank should be situated in front of the window. The water temperature is best kept at around 76-78°F. If you live in a warm climate, letting full sunlight fall on a small tank will not be a good idea, and conventional aquarium lighting should be used. Water from an existing healthy fish tank should be used, or a couple of hardy fish such as guppies can serve to seed the tank. It will not take long for brown algae to appear. Your first purchase of Otocinclus should be added at this point. Since otos are a schooling fish, and many mouths make quick work of algae control, it's best to start with a school of 6 - 10 otos. Feed flake, frozen bloodworm (sparingly) and spirulina disks. We do not feed any fresh vegetable matter at this stage, because we are feeding for quick strength and health. Unless you have a very good retailer or the Otos have been in the shop a long time, they will not be very well fed. Moreover, in a lightly stocked, well-maintained planted tank, there also won't be a great deal of food around for a school of hungry otos. The available non-vegetarian food must be shared with the tank's other denizens. By making sure your otos are well fed prior to introduction into a large tank, they are much more likely to settle in successfully. A well-fed oto should have a slightly rounded, protruding belly with an almost silver sheen to it. Not every aquarist has problems introducing large groups of otos to a planted aquarium, and this conditioning procedure is not a prerequisite to oto survival and longevity. But if you have tried to introduce otos to your tank and been discouraged by the results, the approach outlined above is likely to improve your chances of success. What does it take to maintain healthy Otos in the planted aquarium? Once settled in, maintenance of these fish is quite straightforward and hassle-free. It is common for Otos to congregate in areas of water current, so don't fret over such behavior. A world of warning, though: if you have a strong filtration system, you may need to shield the inlet in such a way as to prevent your Otos from being "filtered". Love of water flow and an inquisitive nature has prematurely ended the life of many an Oto. Practice golf balls (like Ping-Pong balls but with many 6mm holes) or heater guards can be utilized in the Otos' defense. If you are worried about the Otos not getting enough to eat, add small pieces of blanched or quick-frozen vegetables from time to time. Zucchini, cucumber, lettuce and Brussels sprouts are all good. You can buy sucker-footed clips for holding vegetables in places, or just go with the low-tech approach of fastening the vegetable to a rock with a rubber band. Just be sure to remove any uneaten vegetable matter before it spoils and degrades the tank's water quality. Though not exactly common or easy, quite a few aquarists have succeeded in getting their otos to spawn. This is often the result of serendipity, rather than any conscious effort on the part of the aquarist. In large planted aquaria, the first indication that the stork has visited is simply the fact that there are more Otos now than there were a month ago! Eggs are laid in small clutches, usually in remote corners of the tank that are easily overlooked. Fortunately, the tank's other inhabitants also easily miss them; so many eggs often survive to release fry. Only after two or three weeks do the tiny fry begin to resemble the adult form, and it is typically at this stage that they become apparent to the aquarist for the first time. Remember the small conditioning aquarium we mentioned earlier? This is also the perfect breeding tank. Given that you can actually summon the effort to remove them from the main tank, a heavily set female and at least a trio of males should be added to this environment and treated to regular water changes. Eggs are easier to spot in this scenario, and it is best to return the parents to the main tank or another similar holding tank in order for the fry to hatch unmolested. Although some breeders maintain that well-fed Otocinclus do not eat their own eggs or tiny fry, at least as many report much greater brood counts if the parents are removed. We hope we have given you some new insights into the taxonomy and husbandry of these fish and have helped you avoid some of the potential misfortunes that can befall the aspiring Oto keeper. We can think of no better "utility fish" for the planted tank enthusiast and hope that our huge enthusiasm for this diminutive catfish is at least a little bit infectious! (2) The Neotropical cascudinhos: Systematics and biogeography of the Otocinclus catfishes (Siluriformes: Loricariidae), Scott A. Schaefer, Proceedings of the Academy of Natural Sciences of Philadelphia 148:1-120, 1997.